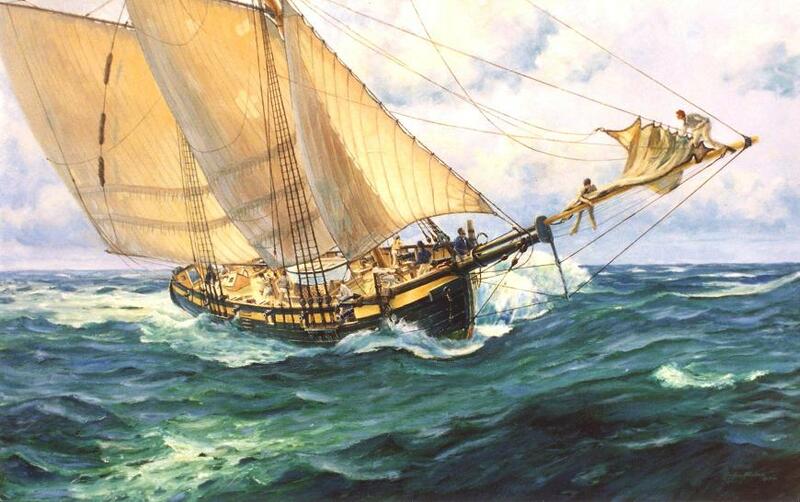 HMS Pickle was one of the eyes of the fleet & often referred to by Nelson. Nelson described the schooner HMS Pickle as “ubiquitous”, an appropriate and worthy compliment for her commander and the men who served her. I chose to paint HMS Pickle in part because I thought, from the ‘Nelson’, Georgian period, she was about the size modern yachtsmen could relate to. I have sailed on schooners many times so have a ‘hands on’ understanding. In this painting you can see several of my friends included crew as portraits, one is Robin Knox-Johnston, another is a self portrait. They are being overseen, watched by LAPENOTIERE the Commander who is standing near the helm, and the boson standing in the eyes of the ship. This fine painting is a present (23 July 2015) in a bank vault in London, one of the ‘Nelson and Trafalgar Collection’ now offered for sale. The owners now (30.06.2016) wish to sell their entire collection. All were paintings were made during the period I was official artist to HMS Victory and working with Victory 2005 Ltd. I have painted another 3 pictures of HMS Pickle, I’m unlikely to paint more of Pickle so make no mistake, this is a rare opportunity for you. For more seeUseful facts + excellent stories about [CF7_get_post_var key='title'].